Asiamoney is considered among the most influential financial magazines and a leading authority on finance, banking, investment, and treasury in the Asia- Pacific region. The magazine is read and trusted by the region’s leading companies, bankers, brokers, investors, regulators and policy makers. The coveted Asiamoney awards identify different banks that have excelled across a range of core banking activities over the past 12 months in the Asia-Pacific region. As part of the Euromoney group, Asiamoney identified the best of the best in all countries across a range of core banking services through a vigorous process which included interviews with the Bank’s senior management in addition to the application being reviewed and analyzed by a team of editors, journalists and researchers. The final decision was then made by the editorial committee. Asiamoney considered the strengths of the entire domestic and international franchise in deciding these awards, across retail, commercial, cash management and payments, foreign exchange, trade finance, capital markets, advisory and wholesale operations. NDB was recognized as the “Best Domestic Bank in Sri Lanka” for the first time among an accumulation of significant Banks like Kotak Mahindra Bank (India), Citi (India), KBZ (Myanmar), Brac (Bangladesh), and HBL (Pakistan). 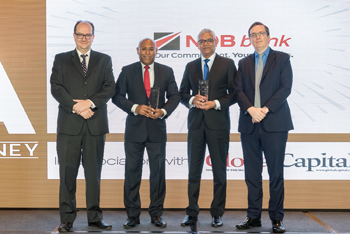 The awards ceremony, which took place at the JW Marriott, Pacific Place, Hong Kong felicitated NDB with three of the most coveted awards in the Sri Lankan Banking Industry: the “Best Domestic Bank in Sri Lanka 2019” and the “Best Bank for Premium Banking Sri Lanka 2019” for NDB Bank along with the “Best Corporate and Investment Bank Sri Lanka 2019” for the NDB Investment Bank of the NDB Group. Winning the “Best Domestic Bank in Sri Lanka 2019” as well as the “Best Bank for Premium Banking Sri Lanka 2019” titles for the first time is a testimony for the dedication of the highly capable team at NDB. The Bank, although not the largest lender in the Sri Lankan Banking industry, is one of the fastest growing banks for many years. The award for ‘Best Bank for Premium Banking Services’ emphasizes on how NDB has outperformed the Bank’s competitors in the market as well as the Bank’s stringent strategy in great initiatives such as digital services and relationship management. This award was won in recognition of the Bank’s years of consistent effort, innovative thinking and fruitful labour. Additionally NDBIB being named “Best Corporate and Investment Bank Sri Lanka 2019” for the third consecutive year comes in the backdrop of winning the “Best Investment Bank Sri Lanka” by Asiamoney’s related publication Euromoney for the seventh consecutive year in 2018. NDBIB recorded a stellar performance for 2018 with all three product verticals of debt capital markets, equity capital markets and M&A advisory performing exceptionally well. About NDBIB: NDBIB is the investment banking subsidiary of NDB Capital Holdings, the largest full service investment banking group in the country holding a complementary business portfolio consisting of fee based and fund based investment banking services, wealth management, private equity and stock broking. NDB Capital Holdings is a part of the NDB Group where NDB Bank is the parent company. About NDB: NDB Bank which is the first and to date the only corporate in Sri Lanka to officially be certified with EDGE Certification, the leading and only global certification for gender equality at work place, is the parent company of the NDB Group, one of the fastest growing financial services conglomerates in Sri Lanka, with the strategic mission to be the dominant leader in the financial services and banking sector. From its inception, the group which includes NDB Bank, NDB Capital, NDB Investment Banking, NDB Wealth, and NDB Securities has been a catalyst in the development of the nation, strengthening and empowering entrepreneurs, corporates and individuals from all strata of the economy. Customers across all group companies have benefited from the product and service offerings of the NDB group.